Transcripts & links are provided below. Greg Howard: How’s it going guys. My name is Greg Howard and I’m the Director of Business Development for LDR21, and we invite you to join us today. Today is a huge day for us. 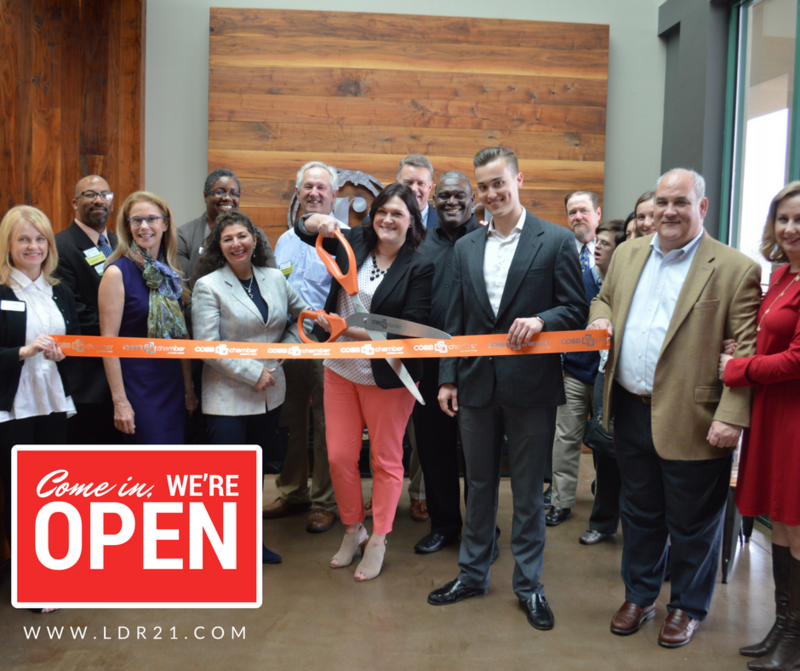 It may be a rainy Atlanta day, but it’s sunny for LDR21, and the fact that today is the ribbon cutting for our business. And, we are incredibly excited about it. So I have Jen Kelchner here founder of LDR21 who is going to answer some questions about what LDR21 does, what drives us, and how this whole thing got started. So glad you could join us. Please comment or leave your questions as this goes long. We would love to hear some feedback from you and love to connect with you through the day. So, what are your feelings right now. It’s the day of the ribbon cutting. You know huge step forward in the business. Jen Kelchner: It’s a big deal. First of all, I’m a little nervous. Um, it’s not like you know I’m going to crawl under the table and cry. I’m nervous because it’s big – it’s you know the people that are watching today that know my story. This is seven years in the making and it’s it’s kind of it’s a lot of emotion behind that, right. Because there’s been a lot of uphill struggles and failures where I hit bottom a couple times. And, then you have to come back from that and recover. So it’s actually pretty awesome. Especially for all my haters out there. Greg Howard: Who will finally see. So tell us more about your journey, or what has had to happen to get to this point today. Jen Kelchner: Yeah. A lot of it was about figuring out who I was. So that’s a process for anybody to have to do. Whether you’re in business or it’s a personal, life journey goal. And so it was it’s um, I have this thing where I don’t believe in the word failure. I think that…failure really is just a process. It’s like trying on jeans for girls. We can’t walk into a store or buy one pair of jeans, right. So we have to go through multiple cuts and sizes and brands and just try different things out. That’s what failure is to me, it’s just trying what works and doesn’t work for you. So it was kind of that whole process of me figuring out who I was first of all. And, really grabbing a hold of what my sweet spots were. And then from there figuring out how I was going to execute it. So it’s just been a finishing process. Greg Howard: So a startup business is an incredible amount of work. The creative process is when you have to go through to get your dreams to this kind of a point. So what is your real inspiration behind LDR21, what gets you up in the morning, to fight the good fight to start this business with such a cause. Jen Kelchner: OK. I’m going to answer that in a second. But I want to talk about the behind the scenes, kind of lifting the veil on trying to do any sort of start up. Umm, it’s not easy and requires a lot of hard work and a lot of hours where you don’t feel like there’s any…that nothing’s coming to fruition with it, you know. For six and a half years, aside from any client work I had, so any type of full time client work, aside from that I put in upwards of in total probably 70 to 80 hours a week for six and a half years [total work time]. I haven’t taken a vacation in a really long time. So that’s the reason it’s so sweet to see today come about, because it’s like you’ve been clocking all these hours into a bank and it’s just now coming to fruition. Now, why I get out of bed is a few things. I think for me it’s just the passion that drives you. And its a definite purpose to what I do, and really if I didn’t have that I wouldn’t bother. Well that’s not entirely true. Um, part of that is always setting a really good example for my children. And they’re really grown children but being able to show them what it’s like to persevere. And even when times are hard and tough and you’ve got a lot of critics a long way they either don’t believe in you or halfway believe in you you know but I give you the pat on the back, “You can do this”, but they’re not super supportive otherwise. So that’s part of it. And then the other part is like “The Why” like the why is what we talk about Team Open. And, those core principles which I’m sure we will talk about in second. But without those core principles in my life I don’t think I could get out of bed on a day-to-day basis. There’s purpose to that for sure. Greg Howard: So the premise behind the whole business – is a question about that is LDR21 helps organizations achieve what’s called an Open organizational mindset. So for those that are unfamiliar with that term what does it mean and really how does it apply to today’s business world. Jen Kelchner: It’s hugely important for a few reasons. One, we’re dealing with an environment we’ve never had to deal with – which is a multi-generational workforce. There are four and in some cases five generations that exist and co-habitate – co-habitate in the sense of working in the same location at the same time – which creates a massive amount of potential challenges for an organization that doesn’t know what to do with that. That’s everything from recruitment to engagement and retention. You know how you structure benefit programs to attract people to stay – to how you actually do your work. You know that’s a – it’s a big challenge. Plus in a 21st century world, we have to remain agile. And so part of open is about being agile. Which is why we chose the hummingbird for our logo by the way. [Look up the symbolism of hummingbirds.] So this agility that exists and that in order to be sustainable over time is it’s really important. Open organizations really have a lot of – there’s actually a lot of – structure to open in terms of the frameworks that you have in your ecosystem to make it work. Everything from your transparency model with your leaders to how you communicate to knowledge sharing tools to governance which we use for decision making. But the five things that are the most important, that are the foundational keys to anything Open in terms of mindsets are transparency, adaptability, collaboration, community and inclusivity. And, I think those five mindsets in general not only create massive change from a business standpoint it creates a global change amongst people. Greg Howard: This one purpose behind the business is not just you changing people’s lives at a work level, but it really changing lives in social ways and with family. So tell me how open really applies to not only your work life but your social life. Jen Kelchner: Well you know, I’m a big believer that you know people are people – you cannot separate who you are when you’re at work any more than you can separate who you are when you go home. I mean we we all express different aspects of our personality where we are – for instance, I’m a very different person in my professional role. The types of language that I use or the way I carry myself is different. My Type A comes out so much in that mode. But, when I’m with friends and family a different part of me expresses. So the laid back part of me comes out, the extreme friendliness and extroverted part of me comes out. So if we think about why we do what we do and how we behave that it becomes part of the understanding that if I’m spending, you know, 40 plus hours a week at my workplace with different people and I’m learning to do things a different way there and then go home then we start behaving that way with our families. So what’s great about it is that if you have these five core principles for instance, and we’re learning to communicate better – then we’re now learning how to do team work at home differently, we are communicating differently in our relationships at home. And ultimately, if we come to our community then to serve in whatever capacity, we’re taking it there and that’s where we start seeing the ripple effect. Greg Howard: So I’d like for you to talk a little bit on which is the Open model because I think that’s really awesome. So the Open model really kind of started in the tech sector and has now kind of been moving towards the business. How in your own words – why do you think that is shifting the way it has been and why you think that now it doesn’t just apply to tech but now it applies to your organization teams in the workplace. Jen Kelchner: You know it’s funny.Wwhen places like you know big players that we think about like a Google for instance – people kind of identify with creative tech places – as they just have hammocks and bean bags and people knock Millennials for that. I watched a video yesterday that knocked Millennials that all they wanted in the workplace were bean bags and free food. And, well we all love free food. But you know beyond that is that’s really not what Open is about. I mean for them that type of environment is about creativity and innovation. But we start talking about Open and it how worked for them there were talking about the mobility factor, working from anywhere to do our work, at different times, and having that capacity to do that. Moving away from hierarchy into a more distributed, collaborative teams with leaders which was really important. And so we see it work. We see people are happier and more attracted to it. They’re definitely more innovative and creative. If you look at tech just in the last decade about the amount of disruption that’s occurred in that space. And so people are going – why aren’t we doing it elsewhere. And when you talk about the fact that 70 percent of the US workforce completely disengaged with work – in terms of mainstream business – then we have to start asking why and then what else we can do to make that change. So with that being said, I think you know leveraging things like Open where we can speak to any generation in terms of how you do your work and having the ability for more leaders to step up instead of one guy at the top.You know. And having more people be able to do their best work. Greg Howard: Sure. So on leaders and about this generation not being engaged. So another goal of LDR21 is to help organizations begin to learn how to manage to rework their organizations in order to satisfy a multi-generational workforce. So in your words why do you think that is critical for organizations to be able to do in today’s world. Jen Kelchner: We’ve got to start addressing that fact that there are four groups. And so there’s thing that generations are actually the more I say this the more I started to get offended when people knock Millennials or Gen Z. It happened this morning in a meeting where I brought up our Gen Z workshop. And they were like “Oh great, more people to fire”. Actually, no. I mean they’re they’re pretty much already on track to be massive disruptors. And I kind of explained the external influencers behind them, right. And if you kind think about how do we break down what each group has been influenced by and understand why we’re behaving the way we are. And then beyond that there are things like you know life stages – their having kids or your not or you’re single. There’s like aspects to that. And then there’s kind of this dimension thing that can happen. One of our team members Jo Burchard talks a lot about this which is the dimensions that people have based on their experiences. So whether you’ve endured some sort of trauma or some other sort of experiences in life can kind of cause you to behave older than you are or sometimes younger for some people. So when you look at that and think how are we going to get everybody to understand each other. In order to team better, to do better work – you have to start at that place to understand. And then you get diversity of thought too. You so you can put people in the right seat. And then you’re collaborative teams that are solving problems have more depth to them. And you know they having diversity of thought that’s pretty significant. Give your people what they need – your clients and customers. Greg Howard: Yeah. So for some that may have just found your way to the page. Now would probably a good time to mention about our new webinar coming up. So LDR21 you don’t have to be a big organization in order for us to give you some good knowledge that we’ve gained in our experience. And, so we’re doing some awesome webinars. Anybody can be part of. So the first one is going to be on Gen Z.
Jen Kelchner: It is. And we did this one – the education model – with a group of about 850 high school students back in January. And it was great. I mean they were really impressed to understand what they were learning in school didn’t apply to the workforce they were getting ready to enter. Even though they were going into college, but just thinking about how they identified their careers. And so from that standpoint we know that it’s very very beneficial for anyone in H.R., People Development and leaders…Recruiting for instance to kind of understand what influences this particular group. What you’re looking for to attract and engage them and what type of work they want to do. And it’s more than just saying we need to have purposeful work that they can connect to which is very important to both Millennials and Gen Z.
Greg Howard: For sure. So we have somebody joining us today is Hayden Ledingham from Berry College. So the question he has for you today is “Have Open organizations been used before? What companies have began to adopt this principle and how it worked for them?”. Jen Kelchner: So yes a lot of people have been using Open. They haven’t necessarily phrased it as Open every time. But you know a big one (And thanks for the question, Hayden. I really appreciate you tuning in and I see my Dad joined too.) But you know we start to talk about Open a particular company a lot of people are familiar with is Zappos. Especially girls actually not just girls we all love shoes. Zappos has been using an open form of open for themselves for a few years. You know they bring some books and do a lot of discussion as well. And so their governance model is different than the type of open org that we talk about which is more meritocracy. But it doesn’t mean it doesn’t work. It works well for them. And that’s probably the biggest. And when you look at a lot of the other big tech giants that operate with kind of an open mindset model. Amazon does a component of it and Google. There’s a lot of people that have taken some of these principles to put in. So it does works. Greg Howard: So some people might wonder you know this is a cool concept. It would really worked for a small group – someone in a tech sector like that when you’re working on software. But how is this scalable for a [larger] company like Zappos. Jen Kelchner: It’s very scalable actually. I don’t want to get to far into them but since we are using as them as an example but abstractly when you have an enterprise size group it’s still possible to do. It doesn’t really comes down to a matter of the size of the organization. It comes down to communication very very very clear communication and a lot of transparency from the bottom up and from the top down. You have to have a lot of clear communication about everything your doing. Because without that, all of the segmented groups of – we’ll just call them projects groups for lack of a better way of putting it – they don’t know what they’re doing. How are they going to operate and make the best decisions possible for either an internal team or for their client. So the knowledge sharing, clear communication and the knowledge sharing portals are key to that scalability piece. And, we actually had an article published on Opensource blog – gosh it’s probably been almost two months ago now – but it was based on a little case study I did on Slalom Consulting group around there and troubles they had with scaling. And, how they use recruitment and culture as tools to solve solve that. But what we found in the case study it really came down to communication. And, how their leaders really reached and sought real time feedback from their people. I think they have 4,500-ish folks employed and they went to the people and got a ton of real time feedback. And they just took their time going through it and implemented what their people said versus what they had to say. Another good example of meritocracy. Greg Howard: So the last question I have for you is another goal of LDR21 is building up leaders in the workforce especially with these younger generations that are coming in and they feel a little discouraged and unengaged. So how do you go about building leaders out of these younger generations that are now entering the workforce. Jen Kelchner: You know this is one of my favorite topics, right. We actually had this conversation the other day because we were talking about how do you bring someone in as a new hire right out of school. And then they kind of get stuck somewhere where their just doing filing – I think example are talking about – and how that turns people out pretty quickly and be frustrated doing what they really love doing. So. You know I think that first of all being a leader has nothing to do with title or role. Its just who you are. Its how you walk out your day to day life, it’s about empowering other people to do their best work while you’re doing your best work. So some people can be managers but everybody can be a leader. And, so there’s a lot of principles with that. So if we educate anybody. And so let’s be clear it’s not just the younger generations that need leadership development. My own generation needs it. That one above me, and it’s just I don’t think people have been taught or they’ve been taught that leadership really is about the title and role. So what office you sit in – you have the corner office, okay you’re the leader. Are you part of the C-suite, then okay you’re the leader. And that really has nothing to do with what actual leadership is. And so I think, when we talk about it in organizations though – there are some key skills that need to be taught from the beginning for both the one that’s entering the group. But Millennials in particular because last year – so you guys are currently 40% of the workforce. And that’s going to. become 75 % in less than 10 years. So 40% right now, twenty-five percent of you last year were promoted into leadership roles because 10,000 Boomers a day reached retirement age. They didn’t all leave the workforce right away. But those that did , we found there was a gap there not enough professional folks to fill the roles right now where or east in all the areas. There could be a number of reasons but there were not enough Gen-X people to move into leadership roles available. So Millennials got pulled and put in to leadership type roles. So because of that in some cases that happened so quickly before that measure of experience could be developed. So there’s just some gaps. It’s not that you’re incapable, you just don’t have as much experience. So having a group like what we do able to partner with your leaders and new managers and help them understand what it takes. And, it could be simple things like negotiation skills for instance or you know communicating or how about this one leading up. So how do you manage somebody either at a higher level than you or that’s older than you. I think probably freaks people out. It did with me actually when it first happened. And so I think there’s things like that that partnering with us are either workshops online or partnering with us to have some to do you know real time on site coaching mentoring and getting people up to speed where they need to be. And it’s totally worthwhile because the ROI on that to an organization is huge. And they where this is going to be another workshop this month we just haven’t promoted it yet but around my high cost of turnover with 30.5 billion dollars (I misspoke during the talk) last year just from Millennial turnover . So I think some of that is really addressing one – utilizing principles that of Open to create a different culture. And two, it’s really educating and empowering people to become leaders. Greg Howard: That’s awesome. Well thank you for answering these questions. So if you missed this live and are watching this at a later date, please still comment on it we’ll get back to you and answer your questions. Or send us a direct message. But we definitely want to connect with you. So please follow us on Facebook. Follow us on Twitter and LinkedIn. We’ve got to be on social media and on demand. Please reach out to us. So for closing remarks. So would you like to say anything to our audience. Jen Kelchner: Sure. First of all, you have got an hour to tune back in and watch our ribbon cutting live. It’s really exciting. It’s really great to watch it take a bunch of pictures but hang on we have more coming after that. But I think other than that I just thank you for being part of this journey with me. Thanks for all of the support and support that you’ve been giving my team in the last two months as we prepared for today and this big launch. And I’m just happy to have you guys along join #TeamOpen. Greg Howard: Awesome. Stay Open, Guys.